Grant access and permissions to multiple account users (e.g., co-workers, employees, and contractors) for a variety of functions in your Rank Ranger account including managing rank tracking campaigns, links, dashboards, white label PDF reports, profiles and more. The number of users allowed per account is dependent upon the package you subscribe to, if you need to add more users, please contact customer service. When you create additional user accounts, they are in essence sub-users of your account and by default have full access. You need to specify which permissions you want to grant to each user, if you don't want them to have full access to account settings and information. Sub-users must be issued unique usernames (e.g., the account should not have a sub-user with the same username as the account owner). Best Practice: We recommend creating an individual sub-user for every person who is granted access to the account, rather than creating team logins. Creating individual users can prevent the possibility of a person deleting a campaign, or changing the team password without informing other team members. Users can personalize settings by updating contact details and adding an avatar, but most importantly, providing each user with a login enables personalized email notifications. When an authorized user logs in and accesses the Email Notifications screen, they are able to create notifications that will be sent to their email address. If everyone uses the account default login, email notifications are only sent to the account owner email address. For client access to reports we recommend granting secure access to a Client Dashboard (very similar to design of the reporting user interface) or Marketing Dashboard branded with your logo. To access the Manage Users screen, click the person icon in the upper right toolbar and select Manage Users. User Types can be defined for quick permissions selection in individual user screens. Click the Manage User Types button. Save: select a default or custom subuser type, make changes to the permissions by adding or removing a check in permission boxes, and click the Save button. Doing so affects all users that are assigned that subuser type. Rename: select any subuser type in the list and change its name. Save as: select any subuser type in the list and save it as a new subuser type (e.g., duplicate an existing type and create a new one by modifying the permissions). Delete: permanently delete a subuser type. This table details the system default Subuser Types. The definition and permissions of subuser types can be modified by following the instructions in the Manage User Types section above. Select a subuser type to quickly load a permission profile, or select individual settings detailed below. Dashboards: Allows user access to the account-wide White Label Dashboards screen. Import: Allows user to import campaigns, and rank history. Export: Allows user to export campaign backup, and custom rank, domain and SERP data in CSV format. Misc Utilities: Allows user access to a variety of miscellaneous tools that are not related to import or export of account data. Access Rank Tracker Settings: Allows user access to General Settings, Search Engines, Keywords, and Websites screens. Create & Edit Campaigns permission must also be enabled for the user. Access Integration Settings: Allows user to add, edit, and delete third party integrations. Create & Edit Campaigns permission must also be enabled for the user. Access White Label Settings: Allows user to add, edit, and delete Client Dashboard and Marketing Dashboard settings. Create & Edit Campaigns permission must also be enabled for the user. Access Enterprise Settings: Allows user to add, edit, and delete Portfolio Baseline and Brand URLs. Create & Edit Campaigns permission must also be enabled for the user. Delete Campaigns: Allows user to permanently delete campaigns (not recoverable). Create & Edit Campaigns permission must also be enabled for the user. Allow the user access to All or Selected Campaigns. If the Selected button is chosen, check the boxes corresponding to the campaigns that you want the user to have access to. Link Manager: Allows user access to the Campaigns Link Manager to view all links account links, Add Links, and Archive or Delete Links that the user created, and view the Link Dashboard and Link Distribution reports. Manage Account-wide Links: By default a user can only manage links the he created or that were assigned to him. Select this option to grant the user permission to manage all of the links in the account. Link Manager permission must also be enabled for the user. View Management Reports: Allows user to view User Summary, Supplier Summary, Profile Summary, and Activities & Expense reports. Link Manager permission must also be enabled for the user. Export Links: Allows user to export links from the Link Dashboard. Link Manager permission must also be enabled for the user. Export Contacts: Allows user to export contacts from the Campaigns Contacts screen). Profiles: Allows user to credit, edit, and delete Profiles used for organization of rank tracking and link campaigns, and white label dashboards. At the bottom of the Manage Users screen you'll find a Login URL, that contains your account user name. Sharing this link with of your Users will automatically populate the Account Login Name in the Team Member login screen. Click the Team Member tab on the login screen and enter your credentials. API & Connected Apps: if an API key has been assigned to the user, and that key is actively being used by your company, then you may choose to edit the key and select a different user. If not, then the key will be assigned to the account administrator login. Notes: if the user has created Notes that display in graphs and reports that are shared with your clients, then editing/deleting those notes will revert to the account administrator login. Email Notifications: if email notifications have been created by the user, and the user is deleted, then the system will no longer send the notifications. Report Presets that were created by the user (unless the user selected Account Wide Preset), will no longer be available. Links created by/assigned to the user will revert to account administrator login unless you bulk update them to a different user. 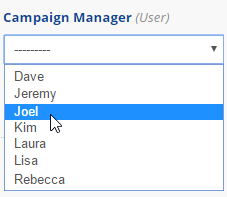 If the user is set as the Campaign Manager in a rank tracking campaign (General Settings screen, Advanced Settings area), and the user is deleted, then the campaign will revert to having no campaign manager assigned.